3- APROBACIÓN DE MEMORIA ANUAL, ESTADO DE SITUACIÓN PATRIMONIAL, ESTADO DE RESULTADO, ESTADO DE FLUJO DE EFECTIVO, ESTADO DE EVOLUCIÓN DEL PATRIMONIO NETO, CUADRO DE BIENES DE USO, CUADRO DE PROVISIONES Y RESERVAS, PLANILLA DE DATOS ESTADÍSTICOS, PROYECTO DE DISTRIBUCIÓN DE RESULTADOS, INFORME DE AUDITORÍA E INFORME DEL SÍNDICO DEL EJERCICIO N° 26 CERRADO EL 31 DE AGOSTO DEL AÑO 2.018. 4- MODIFICACIÓN DEL ARTÍCULO 16 DEL ESTATUTO SOCIAL. 5- ELECCIÓN DE NUEVE (9) CONSEJEROS TITULARES Y TRES (3) CONSEJEROS SUPLENTES POR FINALIZACIÓN DE MANDATO. 6- ELECCIÓN DE UN (1) SÍNDICO TITULAR Y UN (1) SÍNDICO SUPLENTE POR FINALIZACIÓN DE MANDATO. 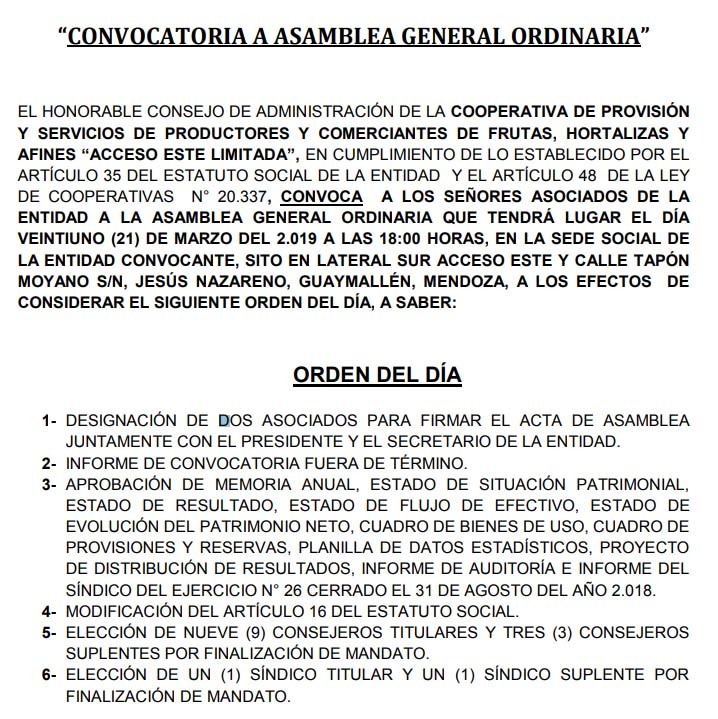 SE COMUNICA QUE LA DOCUMENTACIÓN A CONSIDERAR POR LA ASAMBLEA Y EL PADRÓN DE ASOCIADOS SE ENCUENTRAN A DISPOSICIÓN DE LOS ASOCIADOS EN LA SEDE DE LA ADMINISTRACIÓN DE LA COOPERATIVA CONVOCANTE, SITO EN LATERAL SUR ACCESO ESTE Y CALLE TAPÓN MOYANO S/N, JESÚS NAZARENO, GUAYMALLÉN, MENDOZA (LOCAL 39, SECTOR AFINES). 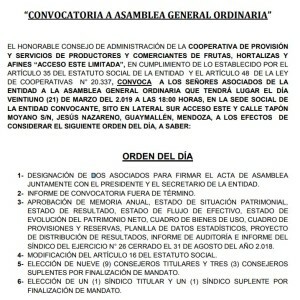 LA PRESENTE NOTIFICACIÓN SE REALIZA EN CUMPLIMIENTO DE LAS EXIGENCIAS PREVISTAS POR EL ARTÍCULO 35 DEL ESTATUTO SOCIAL DE LA ENTIDAD CONVOCANTE, ARTÍCULOS 17, 18 Y CONCORDANTES DEL REGLAMENTO INTERNO DE LA ENTIDAD CONVOCANTE Y LA RESOLUCIÓN S.A.C. N° 493/87.